I’m really pleased that one of the first groups I worked with since joining Dudley CVS, has now become a charity and it was lovely to pay them a visit earlier this week to see how they were getting on. Friends of Huntingtree Park started in 2006 to address issues of antisocial behaviour in and around the park, which was causing the park to be underused and therefore unloved. Supported initially by my Dudley CVS colleague Kate, the Friends set up a simple constitution to formalise themselves as a voluntary group. They were also supported by a network of ‘Friends of…’ groups across Dudley borough and the local authority’s Parks Development team. Friends groups are all sorts of shapes and types of not-for-profit organisation. Some are simple voluntary groups that don’t have much paperwork (in fact, many start this way), such as Friends of Grange Park, which I’ve helped to get set up in the last few months; others are registered charities and incorporated in some way because they have taken on more responsibilities. Some Friends of Parks groups work alongside the local authority to help keep their park looking attractive; some manage buildings on the park; others put on all sorts of events; some try to raise funds to improve facilities on the park; others do a combination of all of these things! Some groups focus on things like nature and biodiversity; others focus on health and social activities. It really depends on what kind of park and facilities are there and of course, on the kinds of things local people want to do on that particular park. I’ve met people from lots of different Friends groups and it’s clear that they have something in common. They all love their local green spaces and understand how important it is to protect them! When I started working with Friends of Huntingtree Park in 2008, they were a simple voluntary group with a constitution and a determination to make their park an attractive environment that everyone could enjoy. Group members were passionate about involving children in the park, believing that if children had a sense of ownership in the park, the park would be loved for years to come. Friends of Huntingtree Park planned a lovely project with Huntingtree and Lutley primary schools; bringing in borough artist, Steve Field, to design and make two mosaics which would be installed at the park’s entrances. I helped the group to access £10,000 in grant-funding from Awards for All and the now-defunct Grassroots Grants programme. The mosaics were installed and they still look beautiful! Nowadays Friends of Huntingtree Park continue their association with the local schools and regularly plant flowers and trees with their pupils. On top of that, the group has good links with Halas Homes, whose community also gets involved in projects on the park. Huntingtree Park was chosen as one of the five ‘Healthy hubs’ in Dudley borough’s Healthy Towns initiative; the Friends think that having a really active Friends group was crucial to Huntingtree Park being chosen. Being a ‘Healthy hub’ meant that the park benefited investment of staff and money that allowed the MUGA (multi-use games area), outdoor gym and other facilities to be developed and many healthy activities to run in and from the park’s activity centre. The park also has a bowling green where people of different ages and abilities get together for a game. The green was previously managed and maintained by Dudley Council, with bowlers paying the Council for access. The Friends of Huntingtree Park has built relationships with the bowlers over the years, helping to purchase equipment and promoting the sport as something anyone can get involved in. Late last year, the bowling green at Huntingtree Park came under threat due to public sector budget constraints. The Friends group entered into discussions with the local authority and the bowlers to explore how the green could be saved and maintained in the future. Everyone agreed that the Friends of Huntingtree Park could manage the green on lease from the local authority. At this point, the Friends recognised that it might be the right time to alter how the group was set up to get them on the right footing for taking on this extra responsibility. That’s when the group asked me for some support to think about how they could develop. I met Alan, Lynda and Jane from the group and we talked about how it might work, what could go wrong and how the group could reduce that risk. We looked at budgets and the pros and cons of charity registration. We also discussed appropriate legal structures that might offer group members more protection when their liabilities increased. With some consideration, group members decided to set Friends of Huntingtree Park up as a CIO (charitable incorporated organisation), which would give them the benefits of charitable status and a corporate structure that would give them some protection. The process involved developing a new constitution for the group; we did a fair amount of working getting the group’s charitable purposes (its reasons for existing) just right so that the Charity Commission would accept them. Once the constitution was ready, it was time to work on the application. I worked with Alan and Lynda on this and the application was submitted after a couple of meetings. We were really pleased when the Charity Commission confirmed a few weeks later that Friends of Huntingtree Park was now a CIO! In the meantime, the Friends group and the bowlers were working together and with the Council to help a smooth transition. When the heads of terms for the lease came from the Council, the group was able to plan with real figures and it looked very positive! The group was able to pay a modest sum per year for the lease, engage a groundskeeper who would do routine maintenance. The bowlers agreed to transfer their subs from the Council to the Friends group to ensure that the green can be used for years to come. And as Lynda walked us around the park earlier this week, it seems clear why this is working beautifully; it’s the relationships that the members of the Friends group have built with bowlers, residents, schools, park rangers, people from other groups. Everyone seemed to know each other and to have time for each other! It was lovely to meet Colin, a bowler who simply started teaching others to bowl a few years ago and hasn’t stopped since, building a social group that gets together for a game. I met Stuart, the Physical Activity Activator, who told us about his involvement in ShareFest! It was equally a treat to meet members of the social group who meet each Tuesday afternoon for an amble around the park, knitting (the results of which often go to babies born prematurely), coffee, cake and a chat. I was so happy to see the networks and friendships that had developed between everyone and this is something that only needs a few ingredients: open, caring people who want to share their skills and a place where they can do it! 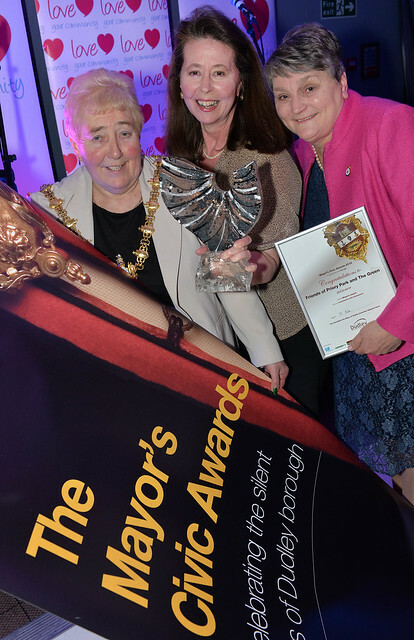 I was delighted to see that some of the fabulous voluntary and community groups that we support had been recognised for their diverse achievements at this month’s Mayor’s Civic Awards.